UIC’s Joanna Burdette, a co-author on the study, said it is a common misconception that ovarian cancer cells are formed in the ovary. “Over the last several years we have come to learn that ovarian cancer cells, specifically high-grade serous ovarian cancer cells, originate in the fallopian tube and migrate to the ovary where they become established as ovarian cancer, the fifth leading cause of cancer death among women,” said Burdette, professor of medicinal chemistry and pharmacognosy at the UIC College of Pharmacy. 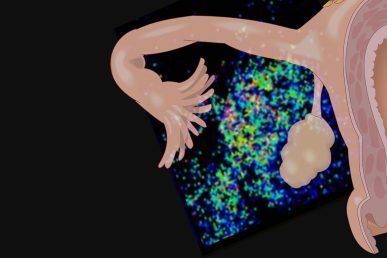 “This tells us that the communication between the fallopian tube and the ovary changes as normal fallopian tube cells evolve to become aggressive, particularly when they are in proximity to the ovary,” Burdette said. 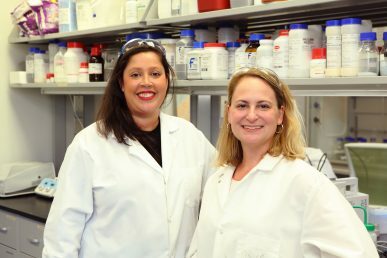 “When it comes to cancer research, chemistry has often been overlooked in favor of studying the impact of various proteins on cell signaling, but here we show that cancer essentially hijacks the whole chemical signaling process between normal tissues to its benefit,” said Sanchez, assistant professor of medicinal chemistry and pharmacognosy at the UIC College of Pharmacy. “This approach has the potential to be applied to a vast range of cell and tissue types to address many conditions,” she said. Additional co-authors on the study are UIC’s Katherine Zink and Matthew Dean. Funding for this research was provided in part by the Chicago Biomedical Consortium, which includes support from the Searle Funds at the Chicago Community Trust; the National Institute of Child Health and Human Development and the National Institutes of Health’s Office of Research on Women’s Health (K12HD055892); the University of Illinois at Chicago Startup Funds; the National Center for Complementary and Integrative Health (T32AT007533); and the National Institute of Environmental Health Sciences (UG3ES029073).